1997 Ford F53 no power from Fuel Pump Relay. Any recommendations on possible problems causing no power to the fuel pump? I am at a loss and could use some help. I have tried two new relays both don't seem to make any difference. When I place a jumper wire between the two pins of the relay I get power. I thought it might be the ECU/PCM but I do get the check engine light when I turn the key at initial start up. When I jump the relay everything runs and drives great. Any way to rule out the ECU? With the fuel pump relay in place I measure ~6.5V at the relay, at the inertia switch and at the fuel pump itself, so it is consistent at all locations and the fuel pump doesn't run. When I jump the relay I get 12V at the inertia switch and fuel pump (and pump runs great). This is on a 1997 32' Winnebago Adventurer. Last fall my fuel pump was failing, backfiring and had loss of power. After having a new baby, I attacked the problem this spring, starting with replacing the chassis battery. I started tested and the fuel pump did not turn on at all. I measured the 6.5V stated above and thought it was very strange, but decided to install a new fuel pump as it was still the original (I understand this is a common failure). I replaced the pump but still did not get power for it to run unless I jumped the relay as I was still getting ~6.5V of output with the relay. The motorhome now runs great when I jump the relay; however, what is preventing 12V to come out of the relay? Where is the relay located? By any chance are there two relays next to each other which look nearly identical? Short pin #6 of the Data Link Connector (EEC Self-Test plug) to ground and see what you get. Between the relay and the power is only one fuse. What two pins are you jumping? The relay is located with the other fuses in the fuse box at the front of the motorhome. It is in a row of 4 identical relays. The fuel pump is the 2nd from the left. I am jumping relay pins 30 and 87. Thanks for the reply and great pictures. The motorhome home is in storage and I can check this out later this week. Hopefully I should be able to find the self test plug. Does the heater blower fan or horn work OK when swapped with the fuel pump relay? Be aware when you turn the key on, the PCM only energizes the fuel pump relay for about two seconds and without an RPM input it shuts off the relay. subford, in your diagram I am jumping pins 51 and 52. I have tried other nearby relays and have the same voltage reading. Randalpho, thanks for the information on the pump turning off if no RPM. I will double check to ensure that is not a cause. I am always amazed at the help from fellow RV-ers. I'm pretty sure mine has an inertia operated Emergency Fuel shutoff switch. I seem to remember it was in the area of the accelerator pedal. Yup, just checked. Mine is mounted about 8 inches above the brake pedal. It has a red reset button on the top of it. I've never had to reset it, but it is there. Pull the PCM and fuel pump relays out and set them aside. Then pull the horn and blower relays and put them in where the PCM and fuel pump relays were. Try starting the engine now. Over the years I have found more relays bad for the PCM than the fuel pump. The PCM relay powers the fuel pump relay. If this doesn't help I would lift the fuse - relay block and look for corroded wires or connectors on the bottom side. Thanks for the info on the inertia switch. I had checked that and was getting the same (low) voltage reading there with the resister in place, 12v when jumping the relay. 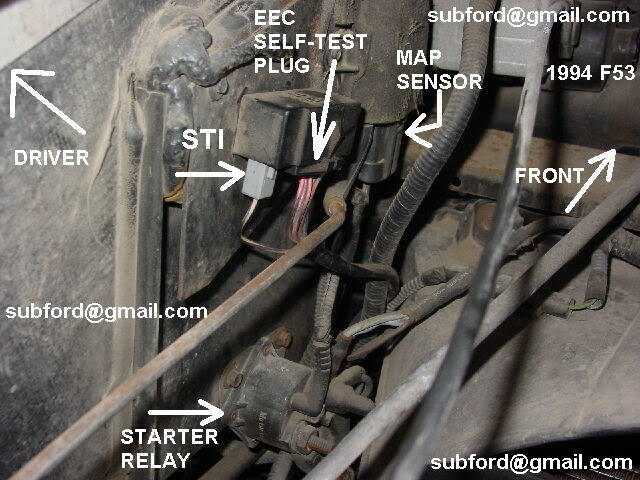 Note that the PCM relay besides sending power to the fuel pump relay coil (not the fuel pump) it also sends power to all of the fuel injectors, other solenoids, the transmission and it powers the PCM Computer. All of these items get power off of a RED wire. Jumping those two pins bypasses the fuel pump relay and uses the same power source to the pumps. If I were guessing I would guess you have a spread or burnt pin socket where the fuel pump relay plugs in to its two power sockets that you are using to jump with. 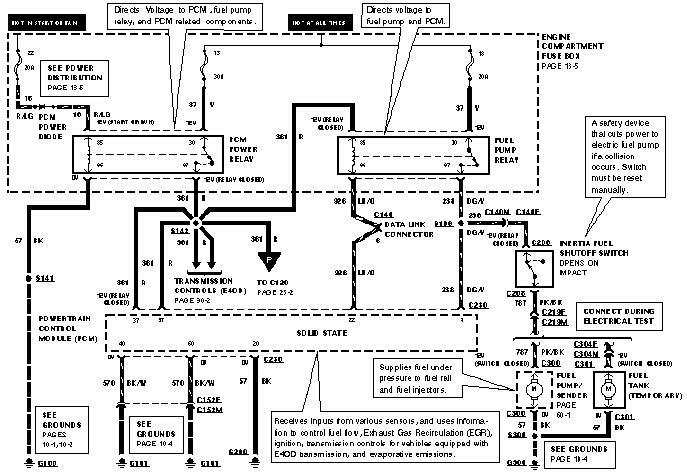 To energize the fuel pump relay the computer grounds the relays control pin which activates the relay. 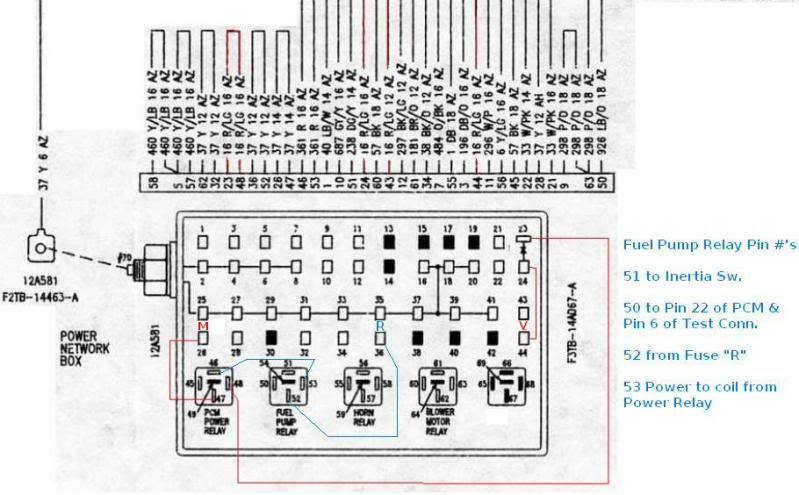 Pin 87 should have battery voltage all the time, pin 86 should also have battery power all the time ( key in run) pin 30 will only have battery power when the relay is energized when the computer grounds pin 85. If the pump works when the fuel pump terminal is grounded the inertia switch,relay , fuel pump fuses, and wiring are good.